The Huntington Library has graciously contributed the above images from their collections. Visitors may link to or download these images for personal research or non-commercial publication. As a matter of good scholarly practice and for the benefit of future researchers, we ask that researchers using reproductions of our materials give appropriate credit when quoting from or reproducing an item in the Huntington collections. Images should be captioned with information about the original source, and quotations should be footnoted. For more information about The Huntington's reproduction policy and citation guidelines, please visit their webpages. 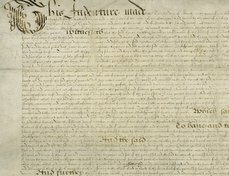 Arden of Faversham was first published anonymously by Edward White in 1592, and has been associated with the Shakespeare canon since the late eighteenth century. The play appears in the catalogue of plays appended to Thomas Middleton, William Rowley and Thomas Heywood’s The Old Law in 1656 directly above The Arraignment of Paris which is aligned with Shakespeare’s name in a right-hand column. 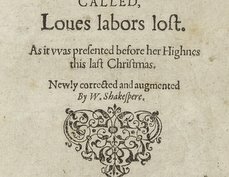 It is possible that an error in lineation obscures the intention to attribute Arden rather than Arraignment to Shakespeare, as few readers or critics have revived the latter play’s claims. In any case, Shakespeare’s authorship was first asserted unequivocally by Edward Jacob, himself a resident of Faversham, in his 1770 edition of the play, and was supported throughout the nineteenth century chiefly by critics keen to make a connection between the play’s Thomas Arden and Shakespeare’s birthplace and mother’s maiden name. The title page has a distinctive layout, presenting a series of moral judgements on the events of the play in a line of downward-pointing arrows, and its particular focus on Alice Arden is somewhat at odds with the content of the play itself, which articulates a series of grievances against the titular victim. 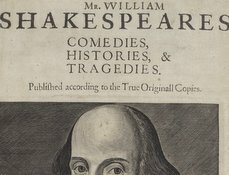 The play itself is printed in black letter, which is in keeping with the moral tone of the title page, and Martin Wiggins has suggested that the play may have been intended for reading rather than performance (Wiggins 285-7). The play is the best-known and most-revived of all early modern plays that still lack firm attribution. Its mix of moral complexity and farcical comedy make it a favourite among directors. Uniquely for the plays of the “Shakespeare Apocrypha,” theater companies who produce the play (e.g. the Royal Shakespeare Company in 1982 and 2014) invariably prefer to leave the play anonymous than trade on the play’s connection to Shakespeare. The play’s authorship continues to be the subject of substantial disagreement (Sharpe 650-7), with views ranging from Martin Wiggins’s insistence that the play was written by an amateur otherwise not associated with the theater (Wiggins 285-7) to MacDonald P. Jackson’s recent monograph arguing that Shakespeare was solely responsible for at least the middle section of the play. In 2007, the RSC Shakespeare was the first edition to include a scene from the play (albeit on the edition’s accompanying website) amid growing acceptance of the attribution’s possibility. 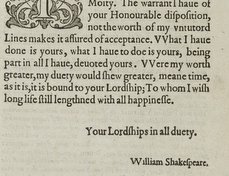 Other candidates for the play include Christopher Marlowe and Thomas Kyd, and as of 2015 Brian Vickers proposes to consolidate his case for Kyd’s authorship in a new edition of that author’s works. MacDonald P. Jackson, Determining the Shakespeare Canon: Arden of Faversham and A Lover’s Complaint (Oxford: Oxford University Press, 2014). Will Sharpe, "Authorship and Attribution" in William Shakespeare and Others: Collaborative Plays, eds Jonathan Bate and Eric Rasmussen, with Jan Sewell and Will Sharpe (Basingstoke: Palgrave Macmillan, 2013): 643-747. Martin Wiggins, ed. A Woman Killed with Kindness and Other Domestic Plays (Oxford: Oxford University Press, 2008).